Chester 360° ~ Telford's Warehouse Chester. Upstairs is a popular restaurant and contemporary art gallery with relaxed attentive service, excellent menu and weekly specials. Telfordâ€™s lower area is reserved for its highly regarded live music nights. The building itself provides one of the more interesting features in the historic city of Chester. Originally conceived by the famous industrial engineer Thomas Telford in the 1790's, the Warehouse stands as a magnificent example of Georgian architecture and as a reminder of the once thriving port of Chester. 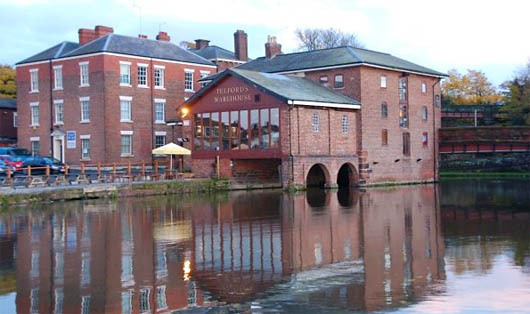 The building was constructed partly over the canal to allow boats to be located and unloaded from the full height of the loading bay within the building. The grade II listed building was originally converted to a public house in the 1980's by local architect James Brotherhood.